North Korea has been hit by worst drought in a century, sparking fears of worsening food shortages, state news agency KCN announced. Main rice-growing provinces had been badly affected and more than 30% of rice paddies were “parching up”, the news agency said. Hundreds of thousands of North Koreans are believed to have died during a widespread famine in the 1990s. This drought is unlikely to be as deadly because of recent agricultural reforms, correspondents say. The United Nations World Food Programme says North Korea regularly faces significant food shortages and currently about a third of children in the country are malnourished. KCNA said rice planting had finished in more than 441,560 hectares of paddy fields “but at least 136,200 hectares of them are parching up”. Paddy fields in South Hwanghae and North Hwanghae provinces were particularly badly hit, with up to 80% of rice seedlings drying up in some areas, the news agency added. It said South Phyongan and South Hamgyong were also “badly affected”. “Water levels of reservoirs stand at their lowest, while rivers and streams [are] getting dry,” the news agency said. It added that it was planting other crops in rice paddy fields of drought-stricken areas to “reduce damage”. Denmark’s ambassador to North and South Korea, Thomas Lehman, told Reuters that he had visited drought-hit areas in the North in May. “The lack of water has created a lot of damage to the so-called spring crop, and the rice planting is extremely difficult without sufficient water,” Thomas Lehman said. 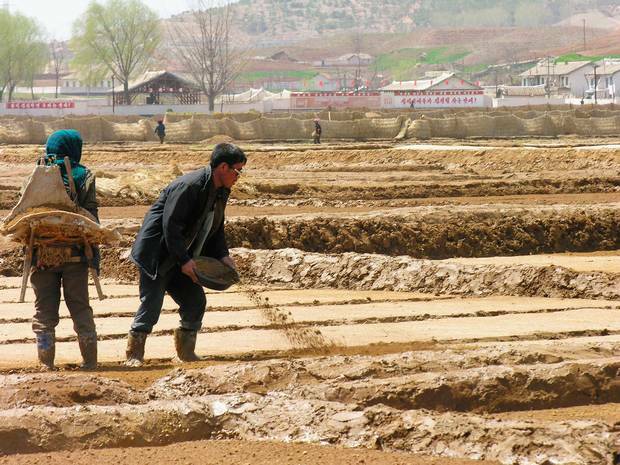 In 2014, North Korea saw its lowest rainfall in 30 years. For this reason, food shortages caused by the current drought are unlikely to be on the same scale, Thomas Lehman says. Other countries, including South Korea, regularly send aid to North Korea. In April 2015, the UN called for $111 million to fund humanitarian activities in food, nutrition, agriculture and sanitation. North Korea is heavily sanctioned under UN resolutions for its nuclear and missile tests dating back to 2006.